We close our 2018 with a recount of the milestones that marked our calendar: a year that meant a great growth in the history of Ciudad Emergente. 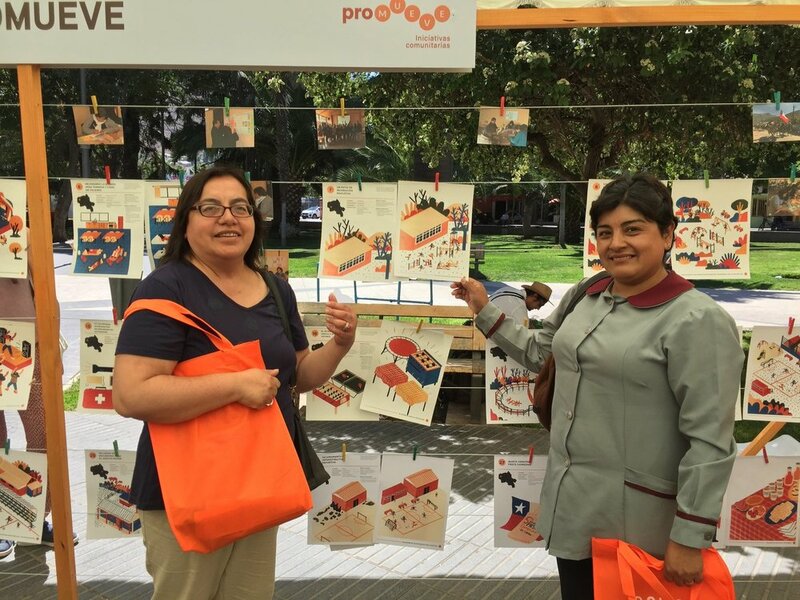 We gave continuity to emblematic projects and we open ourselves to new challenges, both in Chile and in other countries, exporting knowledge, generating empathy and strengthening participatory links. We invite you to visit 2018 of Ciudad Emergente in figures and images. With the main objective of strengthening the street as a meeting place, encouraging participation through culture and promoting road coexistence, the Panama Caminaproject was born together with the Inter-American Development Bank, the Municipality of Panama, the Vía Plural group and supported by the Danish firm Gehl. 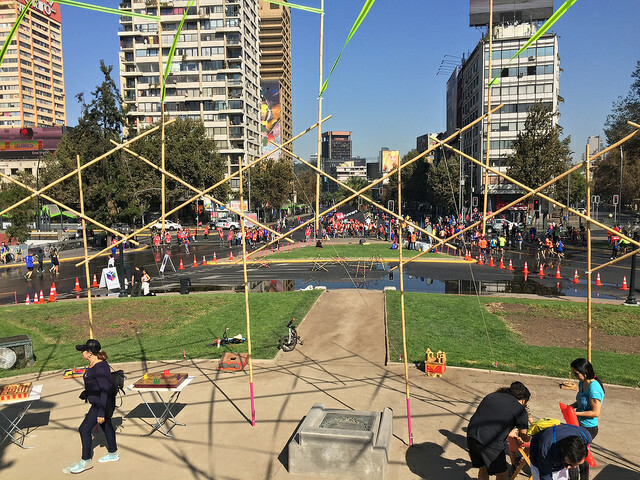 The pilot took place in the vicinity of the Plaza 5 de Mayo, with the challenge of intervening in the heart of the city, seeking to show new forms of social transformation through its public spaces. 2.- Ciudad Emergente arrives in Africa! Invited by the United Nations Development Program, we participated in the International Forum of Mayors in the city of Lilongwe in Malawi, sharing our experience with decision makers from the African continent. In December, we were invited to the Seminar on Social Integration in Nairobi, organized by the Embassy of Chile in Kenya and Strathmore University, where our Director of Studies, Verónica Irarrázabal, moderated the round table on the challenges of NGOs for human development, opening a dialogue between the different actors to recognize the fundamental role of these organizations in the region. Among the challenges assumed by Ciudad Emergente this 2018, are those of Sustainable Development of the 2030 Agenda of the United Nations. This is how the multi-country knowledge transfer project between Chile, Guatemala and Honduras was born, financed by Fondo Chile, which promoted an intervention in Ciudad de Guatemala aimed at addressing the problem of the lack of urban integration of the ravines, rescuing their quality of public space , promoting the preservation of its ecosystem and stopping the contamination of its waters. Part of theShared Cities for South-South Cooperation program, Fondo Chile made possible our arrival in Danlí, Honduras, where we implemented a sustainable transport solution, in the form of shared streets in a zone of great congestion, inviting the community to interact with the public space, opening it to all modes of transport. After the trial period, the Mayor announced the transformation of the pilot into a permanent pedestrian public space project. As a closure to the work carried out by Ciudad Emergente during one year in Honduras and Guatemala - within the framework of the Shared Cities for South-South Cooperation program- the Tactical Urbanism Salon was organized on August 29 and 30, at ECLAC and in the Campus Lo Contador of the Catholic University of Chile, respectively. With the participation of the Minister of Transport and Telecommunications, Gloria Hutt, the Mayor of Danlí, Gustavo Mendoza, the Assistant Secretary for Social Development, Sebastián Villarreal, as well as representatives of the embassies and organizations of Honduras and Guatemala, among others, the results of this project were presented, inviting a series of exhibitors to show their initiatives around the challenge of building more participatory and sustainable cities. 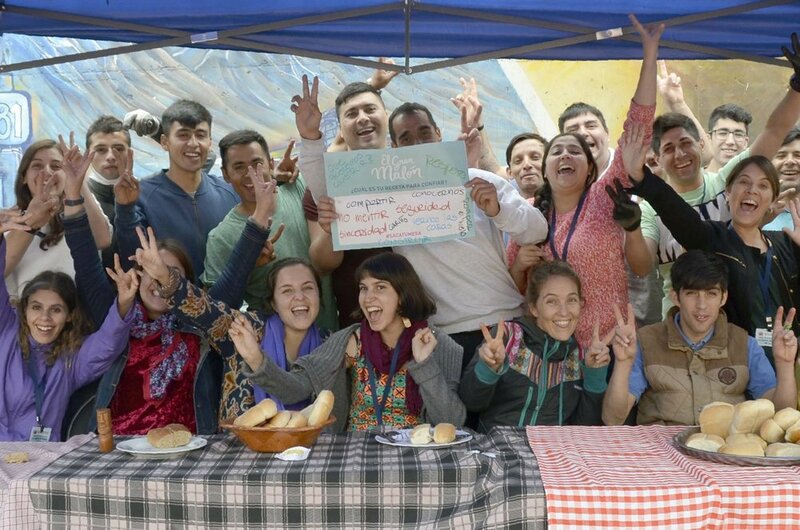 Through self-management and the collaboration of hundreds of maloneros and maloneras, we were able to summon more than three thousand people throughout Chile, inviting them on April 7 to take out their table and share a meal with their neighbors, in the framework of El Gran Malón, generating new bonds of trust to build a more participatory society. The third version is coming in 2019! 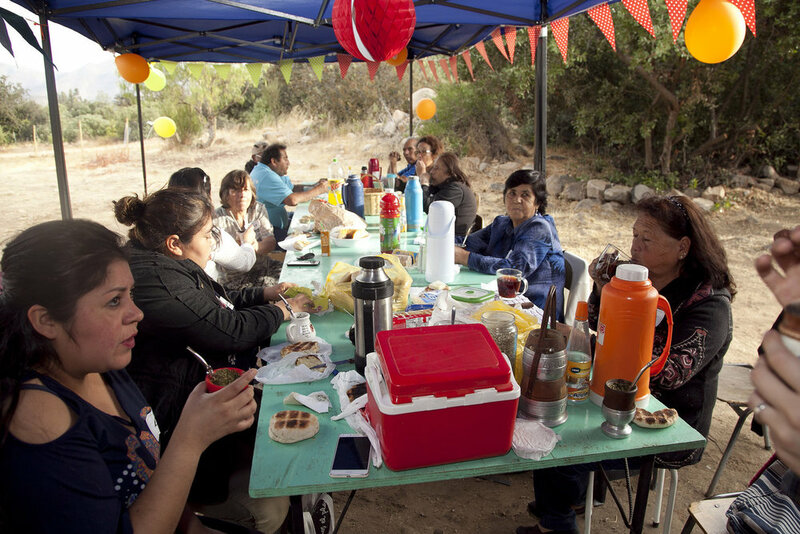 Within the framework of the Somos Salamanca program, on April 28, 2018, La Gran Mateadawas held, an invitation to the entire community to take tables and chairs to share a meal, fostering bonds of trust and participation among neighbors. This 2018 we refined the architectural design in Ciudad Emergente and we carried out the project of the first Socio-Environmental Innovation Park in Concón, led by the architects Bárbara Barreda and Giovana Franceschetto. We join the task of activating the former Asilo Hermanitas de los Pobres, a heritage building that, after being closed for more than 100 years to the community, opens to collectively rethink its destiny. The project, Carmen 1200, invited the residents of the Matta Sur neighborhood to participate in an artistic and cultural activities, promoting the meeting at a large civic party. In the framework of the project Somos Salamanca, of the Municipalidad of Salamanca and Minera Los Pelambres, this program seeks to strengthen and support the capacities of the communities for the development of projects that improve spaces for participation and coexistence. Part of the projectSomos Choapa, from the Municipalidad of Illapel and Minera Los Pelambres, Promueve seeks the collaboration and associativity of the different organizations of the localities of the commune, promoting the development of proposals that promote joint agreements for the improvement of the quality of life of the communities. Organized by a multidisciplinary group of experts from Mexico City, we participate in theCoRe Urban Forum, exposing on the relationship between State and Society, from the experience of Ciudad Emergente in projects of great citizen impact. A network of urban laboratories is being assembled in Mexico, and Ciudad Emergente becomes a part of it. Invited by Casa de la Ciudadand the LUM(Mayab Urban Laboratory), we discussed the scope of our tactics in projects of social innovation, citizen participation, urban design, architecture and long-term planning strategies for cities. 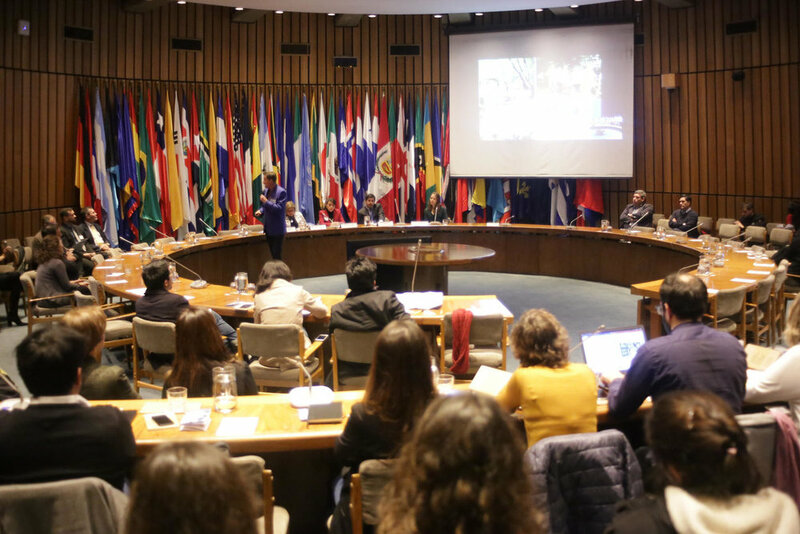 Invited by the Cities LAB of the Inter-American Development Bank, our Director of Development, Kurt Steffens, had the opportunity to share our experience in tactical urbanism with large consultants from Chile and abroad in Uruguay. Invited by the Pontificia Universidad Católica de Ecuador, our Executive Director Javier Vergara Petrescu participated in the Fifth EARQ, International Conference Realities in Transformation, sharing knowledge and supporting groups of students in tactical urbanism interventions in the streets of Ibarra. Led by our Director of Development, Kurt Steffens, during 2018 we started to work and collaborate in Iquique, both doing technical advice for a portfolio of community projects in the northern area of Chile with Collahuasi, seeking to guide the development of these in favor of the communities in the region, such as supporting the Arquitectura Caliente group in a local meeting with architecture students in Iquique. Framed in the ConicytResearch Project of Dr. Pablo Soriano, on November 28 we held theTourism Seminar in Heritage neighborhoods, telling about the scope of this activity in Yungay and Lastarria, in Santiago, and Cerro Concepción, in Valparaíso, opening the debate to reflect on how to protect the life of neighborhoods, the quality of public space and opportunities for local development. We returned to the pearl of the north supporting the CREO Antofagastain the measurements of Public Life of the Walk from Hill to Sea. En la versión 2018 de esta gran fiesta que abre espacios emblemáticos a la ciudadanía, Ciudad Emergente participó invitando a pedalear por una Cicletada de Urbanismo Táctico, recorriendo la ciudad y relatando las diferentes formas que se han gestado en el espacio público capitalino. 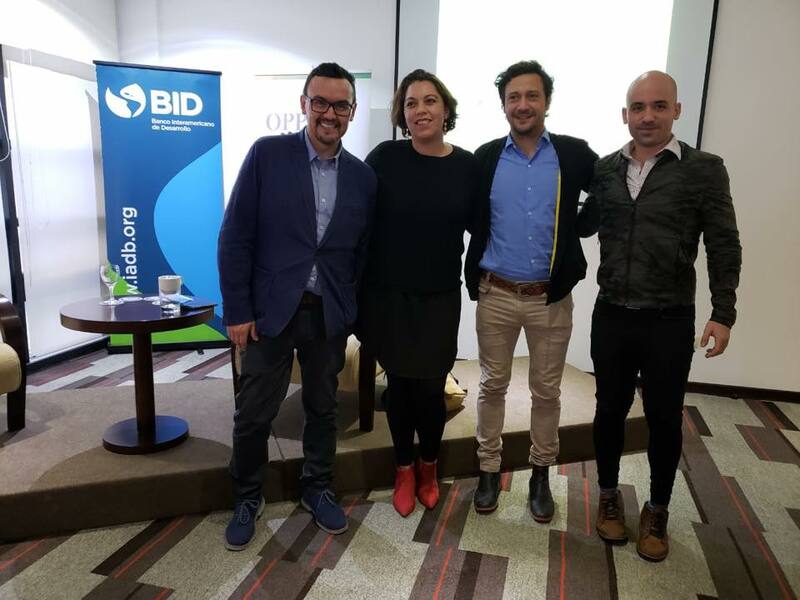 With CORFO Los Ríos and Activa Valdivia, we held a series of meetings with tourism entrepreneurs and national and international mentorsin Valdivia. We turn the sports circuit of Marathon de Santiago into a citizen party, encouraging the meeting and participation in the public space. Thus, in the framework of the Social Marathon, on April 9, 2018, together with Santiago Adicto, we created Okuplaza Baquedano, promoting activities in this emblematic capital point, as well as two urban malones in the immediate sectors of the Central Market and the National Stadium. We were counting our projects in different local and foreign media. In Chile we were interviewed for Revista Viernes; We went to talk about mobility to TVN's Vía Públicaprogram; We were in Santiago Adicto, Radio Zero, telling about the Carmen 1200Cultural Activation and Radio Pautagiving an advance of the neighborhood issues facing tourism. In Panama we went to the radio station L.A. Megato explain a little more tactical urbanism pilot that we developed in that city from November 17 to December 16, in addition to appearing in important local media such as La Prensa, TVN Newsand La Estrella. Finally and closing the year we appeared highlighted by Art Place Americaas one of the best interventions made in Washington DC, United States, thanks to our Okuplaza Fest. In 2018 we incorporated our Communications Coordinator, Javiera Alfaro, our Administration and Finance Coordinator, Paulina Castro, along with a large team in Salamanca, Illapel, Iquique, Guatemala, Honduras and Panama. 1 vision: Collectively build cities to make them more livable! Happy new year to everyone who emerges with new ideas for the city! *** In 2018 we develop projects in Chile, Argentina, Uruguay, Mexico, Ecuador, Panama, Guatemala, Honduras, Kenya and Malawi. **** We thank the more than 50 institutions that supported nationally and internationally, and especially the Inter-American Development Bank, Municipality of Panama, Illustrious Municipality of Santiago, Undersecretary of Regional and Administrative Development SUBDERE, to the Regional Government of the Metropolitan Region, Municipality of Valdivia, Fundación Techo, Fundación Colunga, Fundación Ciudadano Inteligente, BASE Pública, Association of Municipalities of Chile, Fundación Junto Al Barrio, About Networks Foundation, Mi Parque Foundation, Santiago Adicto, NGO Espacio Lúdico, Quiero Mi Barrio Program of the Ministry of Housing and Urbanism, the United Nations Development Program and AGCI Chile and we are especially grateful in Guatemala for the Crecer Guatemala Foundation, Torus Workshop, Acá Workshop, Aricneco, Urban Jungle, Guatemala.com, Urban Planning, Inverted Ravine, The Nature Conservancy, Fundaeco, WWF Guatemala and Mesoamerica, GGBC, TECHO Guatemala, Ambiento, Radio Infinit to Guatemala, Guatemala Sagrada Familia College, USAC, Universidad del Valle, Rafael Landivar University, Sherwin Williams, Montesco Winery, 1001 Nights, Saul Bistro, Hatsu and CAP.